God has been blessing Sister Dias and I. Last night after an amazing first day at the Beehive house (Where we don't get many referrals at all as we talk mostly about history more then beliefs which we are trying to change.) We came to TC (teaching center) and started taking chats. Every chat was someone wanting to know more about the church out of the 6 chats we took 4 referred and wanted the missionaries to come over! I took this as a sign as Sister Dias really don't like our current assignment, but is trying to accept it and be a happy missionary. I saw this as a blessing for our obedience in taking a call that wasn't originally ours. Today is Pioneer Day so this morning. 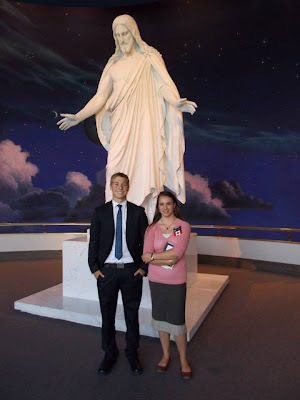 I got to go to the early morning devotional with one of my new Zone Leaders and listen to the beautiful music and hear Elder Ashton of the 70 speak. Then we headed to find a spot to watch the parade. Some senior missionaries saw us walking and called us up to their apartment walkway to watch with them, they also fed us :) The parade was great and I used up my whole memory card with pictures and videos. It was the longest parade I have ever attended 2 hours! I also saw some familiar faces this week to! The Parker family from my old ward in Medicine Hat came and said HI. I was walking back from the pioneer parade I saw Brian another friend from that area. But the most surprising was seeing Christian a childhood friend in the NVC (North Visitors Center). I hadn't seen him in 4 years so it was great to see him before he entered the MTC to start his mission on Wed.